3) offer a site for collective debate, the airing of criticism, and the reporting of new discoveries. There has never been much evidence that orthodox associates of the Order of the Third Bird have engaged in any sustained way in “Birdish” practices of attention to natural landforms — or, indeed, to “natural” objects more generally. While a number of “divergent” tendencies (one thinks immediately of the twentieth-century Russian “Korfians,” about whom Justin E. H. Smith and others have written at some length; and on the “Oannes Scrap” and the activities of M.I. Return Maycomb in the 1820s and 30s) have arisen that do indeed perform attentional rites on the night sky, the ocean surface, horizon-lines, and various other non-canonical objects, the basic widely accepted rubric for the Practice has long been that devotees attend on “objects made to be seen.” This seems to have been interpreted widely, and admitted also of other sensory modalities. But the notion of “intent” has been paramount. In this context, doing a Bird Action on a natural object (a tree, say, or ordinary rock) can been understood to raise theological questions of some depth. Working the edge of this problem has been a preoccupation of several known volées operating in North America and Western Europe since the 1960s, and we have secondhand reports (in the W-Cache and in oral traditions) of active debates around the suitability of a bonsai tree as a “Work” in the sense acknowledged by the main line of the Avis Tertia (the preponderance of collective opinion on this was affirmative). Another striking “boundary case” has been Robert Irwin’s epochal “String Drawing – Filtered Light” of 1976 (a delimited patch of grass in the garden of the Venice Biennial, which heralded the young Irwin’s move to the thresholds of direct sensory experience via bracketed bits of the world). There has long been a rumor that a Southern California volée performs an annual Action upon a pastiche of this work installed anew every May near Twenty-Nine Palms in Wonder Valley. There seem to be a small number of dissenters who, in a ritualized (and apparently friendly) manner, “protest” this Action every year. Both groups finish the day with a cookout, if these reports are to be believed. All of this makes the present photograph of interest. It came to light in 2015, in materials related to the estate of a Los Angeles researcher long associated with ESTAR(SER). 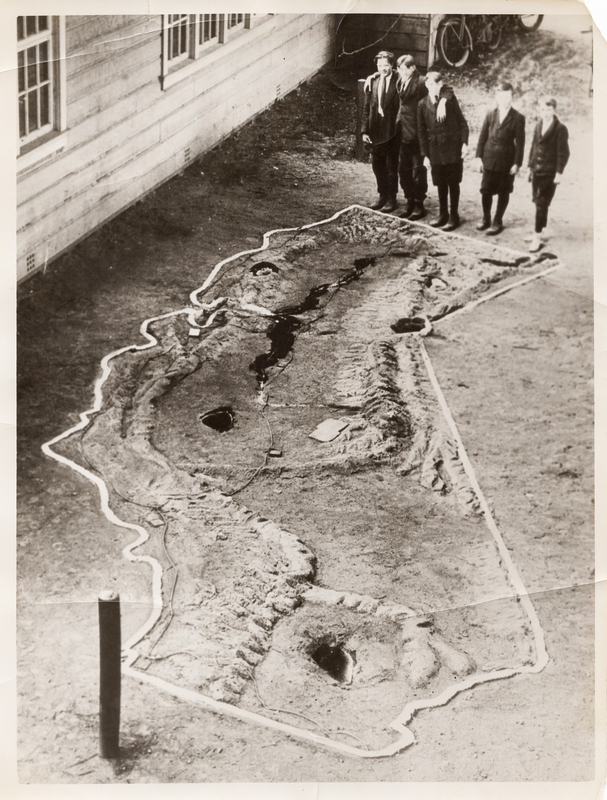 It would appear to represent an Action of associates of the Order working in Ohio in the mid-1920s, using a “Protocol for Topography” that has not been preserved. Anyone in possession of information that might bear on this document is encouraged to follow up with the Editor of the Communiqués directly. At the time of his death in 1961, the German classicist Werner Jaeger was widely reputed to be the greatest scholar of Aristotle’s philosophy in the modern period. His reputation was secured already with the Studien zur Entstehungsgeschichte der Metaphysik des Aristoteles of 1911, while much of his later work was dedicated to the recovery and edition of lost or unknown texts of classical antiquity. These include, notably, two treatises of Gregory of Nyssa and Macarius, which he published in a critical edition in 1954. Among the papers in his considerable Nachlaß are transcriptions of three Greek texts attributed to a Pseudo-Aristotle, which is to say an author, likely of late antiquity, writing in a consciously Aristotelian style, or even in imitation of the Stagirite with intent to deceive readers. These are entitled On Napping, On Foam, and On Beans and Pulses. A fourth text, archived along with these others at the Houghton Library at Harvard University, is found only in German translation, written out in Jaeger’s own hand, and is attributed, puzzlingly, to a “Pseudo-Pseudo-Aristotle”. 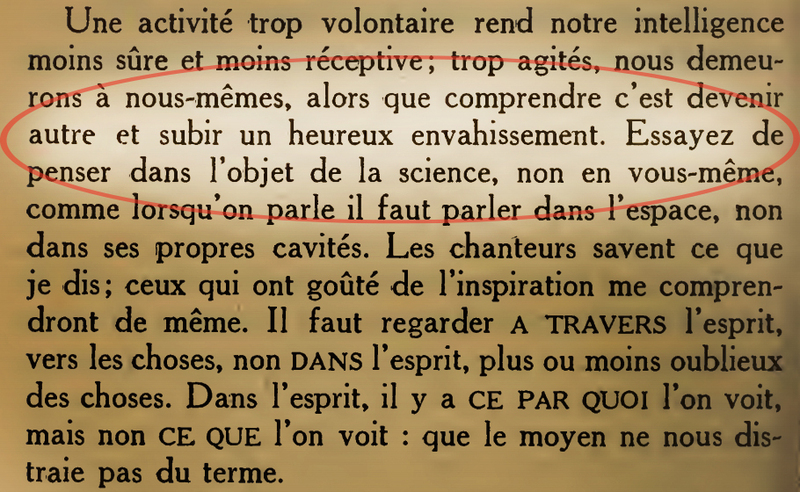 Some scholarly debate over the past decades has been focused on the question whether this curiously monikered author was pretending (the common interpretation among French and Italian scholars) to be someone pretending to be Aristotle —l’imitation d’une imitation, as Grillet (2003) wrote, evidently riffing on Plato’s dismissive characterisation of figurative art–; or whether (as Germans and Anglophones generally believe) the “Pseudo-Pseudo-” may be read as a double negation, so that the author was in antiquity falsely believed to be falsely believed to be Aristotle, which would be so much as to say, in other words, that he was Aristotle. The title of the text in question is On Attention. We cannot resolve the question of authorship here, nor can we determine under what circumstances Jaeger acquired the text, nor what happened to the Greek original, nor indeed, with any certainty, whether there ever was one. 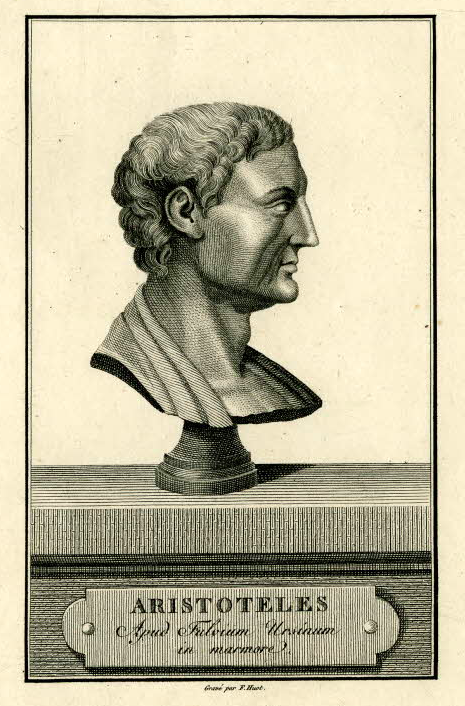 We shall, nevertheless, here below (scroll over the bust), provide a translation of the German manuscript, supplementing it only sparingly with footnotes, where the text plainly requires interpretation, or where it evidently alludes to other parts of the Aristotelian corpus. In the course of a recent re-cataloguing of W-Cache materials improperly translated with the Milcom Papers during the Mana Library Installation, two members of the Trustees took note of the leaf depicted above, which represents a modification of a Sheffield “Light Car” known as the “Flyer.” The original Flyer was developed by the Sheffield Co. of Three Rivers, Michigan in the early 1890s, though this unusual model (unlike many other Sheffield specialized railway hand cars) appears never to have gone into wide production. It is nevertheless described in some detail, and accompanied by a print much like this one, in the trade gazetteer The Sheffield Car Co. (1894). 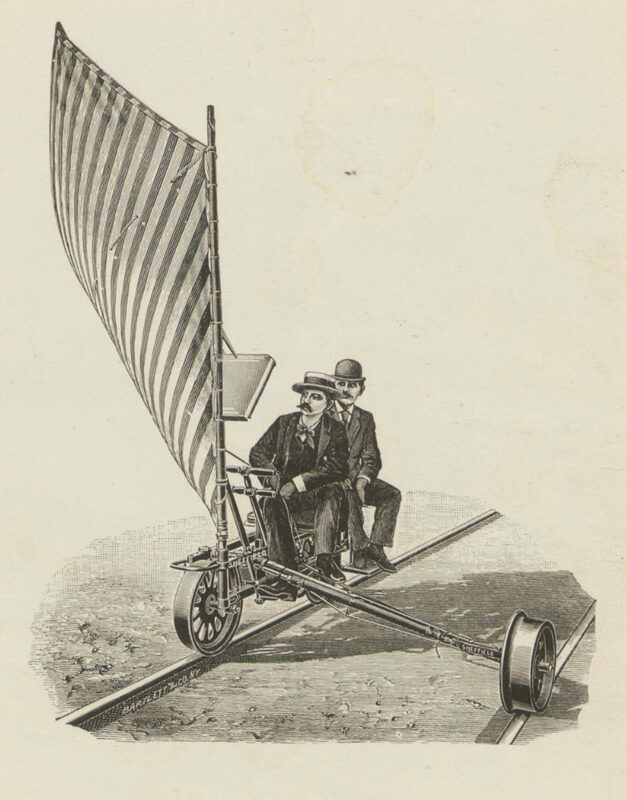 While obviously somewhat impractical, the Flyer was reported to achieve speeds of thirty miles an hour downwind in a stiff breeze, and thus offered a nearly unprecedented somatosensory experience for late-nineteenth century thrill-seekers. What makes this (previously unknown) W-Cache etching unique is the addition, visible in the reproduction, of a kind of easel or “display board” cantilevered out from the mast, and configured to be optimally visible to the passenger of the vehicle. 1) The W-Cache contains sources that indicate that this modified Flyer was indeed developed as a kind of private and secret “skunk-works” project by principals of the Sheffield Car Company in the early 1890s. 2) These sources further establish that the vehicle was known as the “Velocispector,” and that the purpose of the cantilevered easel was to permit experimentation with practices of sustained attention to works of art while travelling at high speeds. 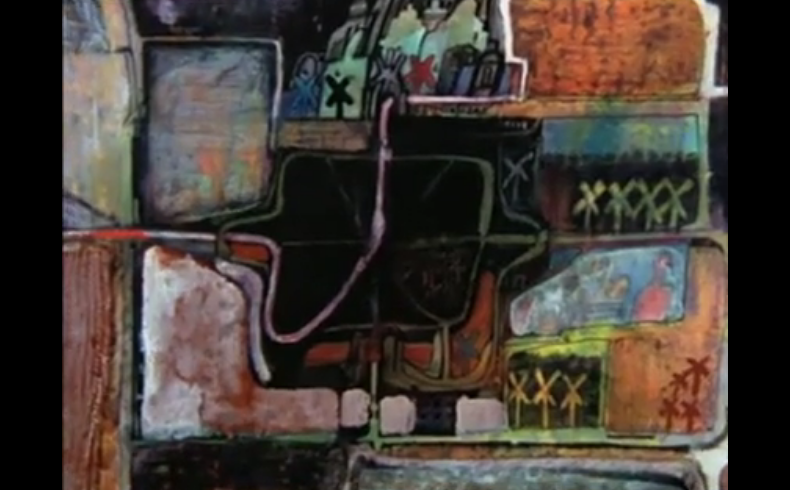 3) Which is to say, the Velocispector allowed an intrepid aesthete to mount a painting, drawing, photograph, or other work of two-dimensional art of conventional size to the angled mast-board and then regard it intently as both viewer and viewed accelerated to great speed along an (unused) rail line. 4) These same sources strongly suggest that this “extreme-sport” of art-appreciation emerged out of a secretive cohort of attentional devotees active in St. Joseph’s County, Michigan at the turn of the century. 5) It is difficult to believe that these persons were not associated with a community that we would now recognize as a volée of the Order of the Third Bird — a volée experimenting not merely with the aesthetic vertigo of railway travel generally, but with specific problems of high-velocity contemplation. 6) Research to this point strongly suggests that the following individuals knew of and/or participated in this work: Edward B. Linsley and Warren J. Willits of Three Rivers, Michigan (both principals of the Sheffield Car Company, and both also philanthropic founders of the Three Rivers Public Library, later the Carnegie Center for the Arts); Evelyn B. Gray and Rose Van Burin (of the Sturgis Sorosis Club, Sturgis, Michigan, which appears to have been the nexus of the community as a whole); and Sue I. Silliman (of the Three Rivers Isabella Association). 7) At least one series of these Protocols of Locomotion (also known as Actions of the Wind) was conducted on a set of Adolphe Braun’s photographs of the Sistine Chapel, then on loan from the State Public Library. More work is wanted, but a full treatment may be expected within the year. We agree. Anyone with further leads is encouraged to follow up. 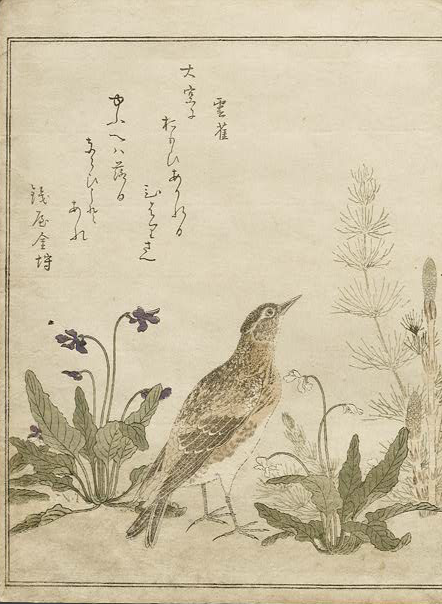 Quite aside from the difficulties and mysteries encountered above (in “Sanchōden: The Transmission of the Three Birds” and “The Absence of the Third Bird at Nikkō”), we would also like to share a diverting image that arrived over the transom from a correspondent who provides only a “bird name,” as traditionally adopted by associates of the Order of the Third Bird. The caption scribbled on the reverse of this photograph, taken in apparent haste, is as follows: “Workroom and headquarters, Secretary Locotenant of the Order of the Third Bird.” Many of our readers are in proud or bemused possession of one of the many contradictory and fragmentary images of the Locotenant currently in circulation. The present photograph is unusual in that it does not purport to feature the Secretary him- or herself, and also appears to be quite contemporary. 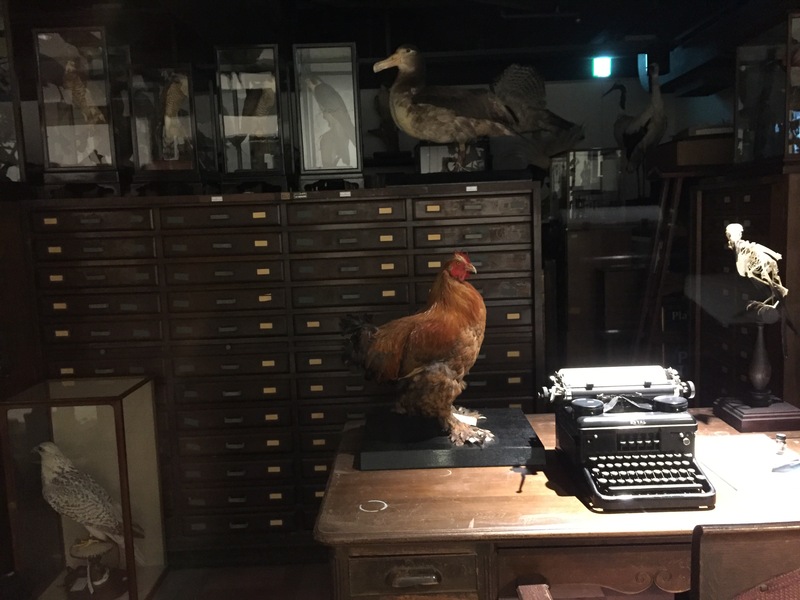 While we were in the process of composing the preceding entry (“Sanchōden: The Transmission of the Three Birds”) we had occasion to consult with a correspondent presently located in Nikkō, Japan. 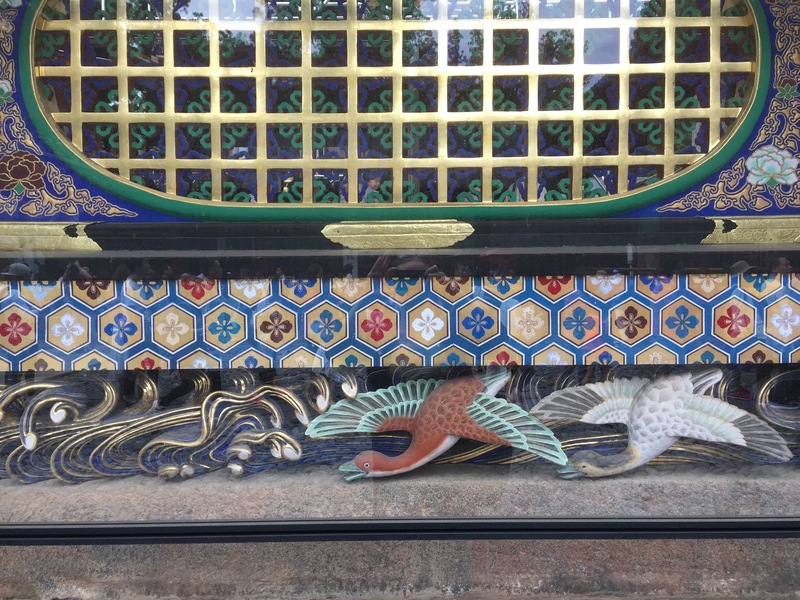 She had become interested in the recurrent bird imagery on the third ring of walls surrounding Nikkō’s Tōshōgu temple complex, which enshrines the founding father of the Tokugawa shogunate. The decorations on this ring of walls are composed of colorful vignettes of two birds or three, of a variety of species, possibly bearing some symbolism but on the whole – in line with the rest of the Tōshōgu complex – existing to display ornate artistry and opulence, and implicitly questioning the extent to which it is possible to torque, torture and exalt matter to proclaim, reflect and supplement the glory of a given being. Our correspondent highlights two adjacent and very curious vignettes (reproduced here as photographed by her). 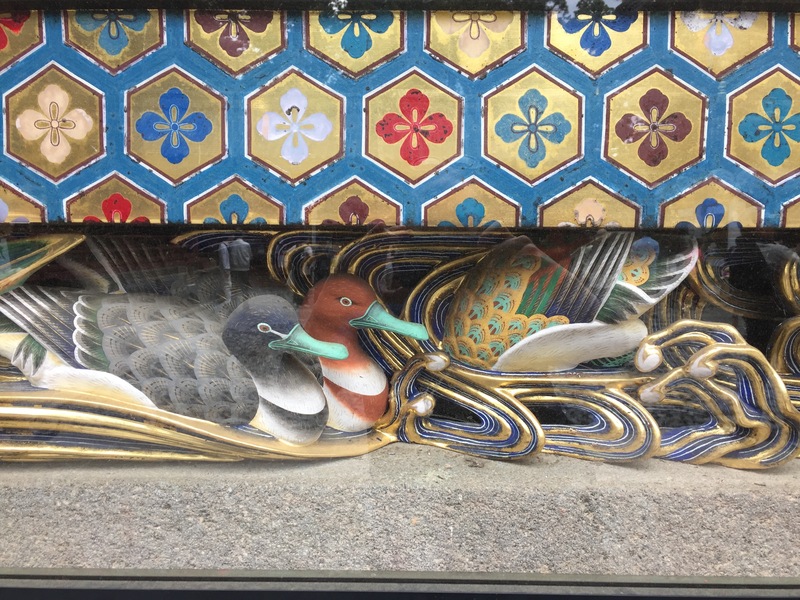 The first features three ducks, one of which has slipped underwater – a common enough motif that might easily evoke to Birdish sensibilities a propensity to dip below the surface of things in pursuit of some elusive aesthesis. 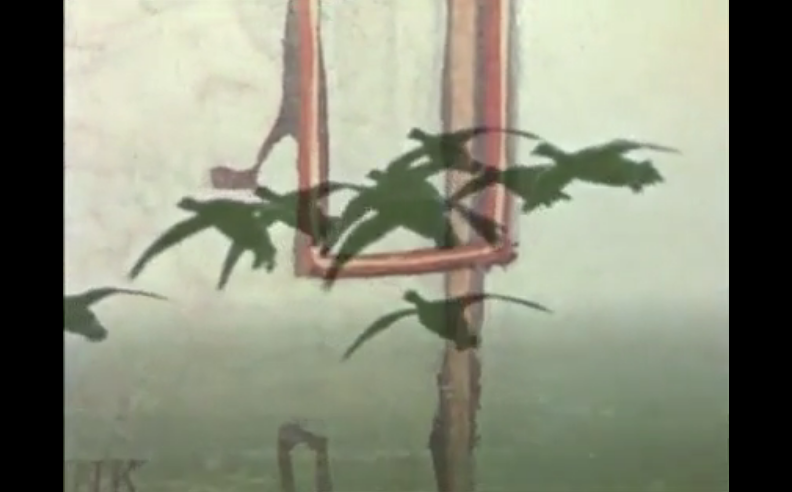 In the second, the two birds that were on the water’s surface are now in flight, and the third is nowhere to be seen. This third is betrayed only by the roiling of the water, and by the gap where it should be, and is not. The pursuit of meaning here, if meaning is to be pursued, must be something like following along the length of a single filament of spider silk – invisible to the naked eye and almost impalpable, though surprisingly robust. As the poet Kakiaji no Seiei famously observed, if only one thread in a bolt of white cloth is blue, anyone might, upon close observation, discern it – but only a poet sees that the cloth yearns to be blue. 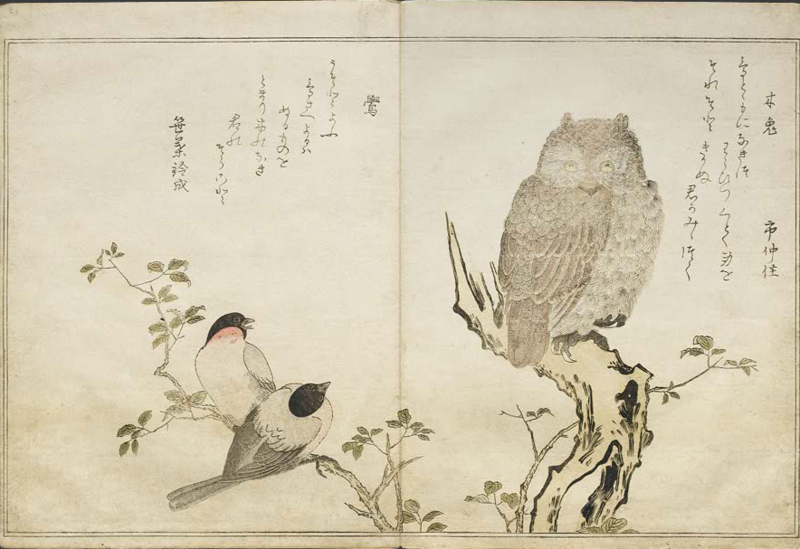 The craftsman of these bird vignettes at Tōshōgu – if indeed he was a conscientious adept of an Order resembling that of the present day (in Japan or elsewhere) in its sensibilities and purposes – would have been certain, here, to disguise his profession of faith and fealty as a mere absence. In so doing, he made this absence an unmistakable emblem of the very thing he had so carefully omitted. For the third bird is in fact not there. In order to pursue it and reveal its presence, one would have literally to dive below the surface of this image, or below the surface of the matter that composes this work – which of course, save for the very particular circumstances of an Action of the Order, is quite impossible. The origins of the Order of the Third Bird as we know it today – a self-aware organization capable of transplanting itself internationally, like the manifesto-driven cultural movements of centuries past ­– are increasingly well-established in their late 18th-century European milieu. Aside from the fact that such facts, once established, become the bulwarks of an establishment and must be contested as such, nothing of this precludes, or has precluded, the convergent evolution of like-minded groups in other places, at other historical cusps, bearing other names and often wearing strange plumage. Even so, it is startling when these convergent “species” of group-oriented aesthetes, having evolved to occupy a very particular niche in a society that comprises humans and works of art, evince a historical continuity or channel of influence where none could factually exist. The question of whether, given such evidence, we must revise our carefully constructed histories, or understandings of history, or simply chalk it all up to coincidence, can only be in the background in this short account, silent though not inert. On several occasions, groups of associates of the Order of the Third Bird traveling in the Kanto region of Japan and particularly in Tokyo have occasionally come upon what appear to be volées of Birds carrying out a Protocol of sustained attention before a work of art. When questioned – for what little good this did – they did not appear to have pledged comradeship to any other group or individual, of the Order or otherwise, or even to be aware of the latter’s existence. They wore green cotton tunics or baggy green trousers instead of the saffron-colored strips or bands so frequently seen among contemporary Birds; their “practice” appeared to consist of two or more phases, separated by a loud clap in unison, as one does in a Buddhist or Shinto temple. What is most extraordinary, and most difficult to explain, is that they refer to themselves as members of a group called “Sanchōdōkai,” which can be roughly translated as “the order of the path of [the] three birds”; they dress in green as a kind of visual pun, since the Japanese word for “green” resembles one reading of the Chinese-derived characters for “three birds.” An individual cell of the group is called a wa, after the Chinese character meaning “wing,” which is also a counter-word used for counting birds. Requirements for membership in these groups are strict, including guidelines for personal appearance and private routine, and every new member receives a suite of “secret teachings” from a group elder, complete with ceremony and song. What has not been fully understood until very recently – in research forthcoming in the Proceedings and generously previewed with us here – are the details of what this Japanese “Order” perceives to be its genealogy. Here, some troubling matters are clarified, though others are obscured. Consider the fact, first of all, that the three most common noms de plume chosen by members (a practice similar to that of Western members of the Order) are yobukodori (literally, “calling bird”) inaōsedori (literally, “rice-bearing bird”) and momochidori (perhaps a bush warbler, though the word largely means “a multitude of birds”). 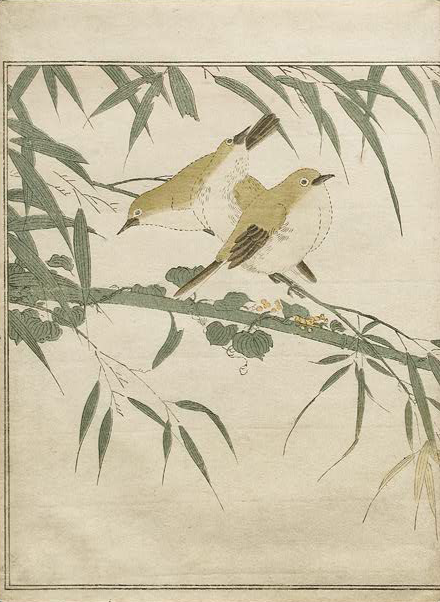 These are the names of birds that appear in the Kokinshū, the great Heian-period anthology of waka poetry that set a standard for the poets of generations to come. Translators of the Kokinshū, from the earliest days to the present, have faced thorny challenges in decoding these names. Mysteries and esoteric meanings were part and parcel of waka poetry both as practice and as institution. Scrolls containing “secret teachings” pertaining to the composition and interpretation of poetry were passed down the generations from poet-master to poet-disciple. An aspiring poet would receive, in utmost discretion and highest ceremony, a kokin denjū, or “transmission of the secret teachings of the Kokinshū,” a section of which was specifically devoted to the “transmission of the three birds,” or Sanchōden ­– a revelation, varying greatly from master to master and lineage to lineage according to inclination, learning, and zeal, of the true identity and complex symbolism of the birds. In fact, what we increasingly find, among the waka disciples and waka masters, is something of a secret society of adepts founded on an increasingly exuberant weaving and reweaving of esoteric mystery around what was originally no more than the difficult attribution of certain nouns in old texts, a tissue of willful misreading and mis-erudition, of rambling associations drawn from botany, astrology, and Chinese philosophy, of spontaneous fictions taken up and closely examined as if they were the holiest writ. As it happens, the contemporary Japanese practitioners of the “way of three birds” – to be distinguished from the “way of the third bird,” since evidently they borrow their birds from the waka “secret teachings” tradition of the three birds and not from the Ausonian parable more familiar to our readers – have willfully derived not only the terminology and the ritual solemnity of this tradition, but the spirit of hermeneutical folly that animates it. 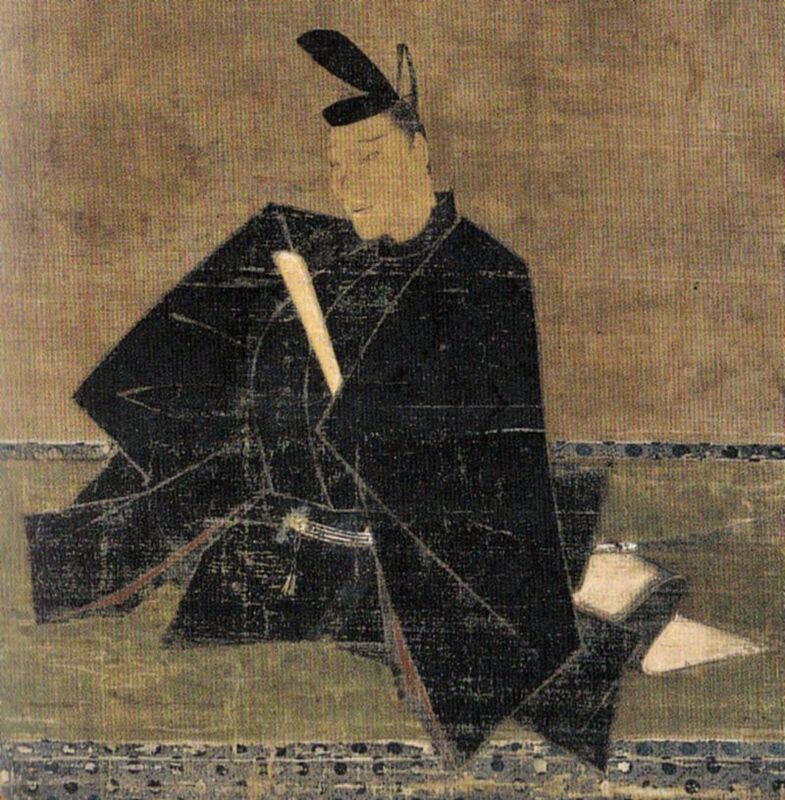 Portrait of the poet and poetic compiler Fujiwara no Teika (1162-1241), patriarch of more than one waka-poet lineage. But how and why, exactly, did they arrive at the point of conducting collective rituals of what is unmistakably sustained attention to works of art, from national treasures to foreign imports to casual civic works? Our researchers are presently in possession of a scroll that most recently belonged to a member of one of the great waka families, not previously catalogued, and which firmly belongs to the tradition of delirious exegeses of “secret teachings” so disparaged by those, like the Edo-period scholar Motoori Norinaga, who later (in the words of former University of Tokyo professor Basil Hall Chamberlain) “brought the light of true philological criticism to bear on the texts in question.” Here, the three birds of the Kokinshū are made, remarkably, to correspond to three phases of a sketchily-described ritual action. Before we draw any hasty conclusions and do as many of our colleagues delight in doing, finding here yet another protocol to add to our catalog, we must note that any individuals making practical use of this late Muromachi-period document must surely have pursued purposes palpably foreign (if congruent) to those of the Order. However – and here is where further work is urgently needed – it is also the case that many of the contemporary Japanese “three birds” groups use a ritual protocol which is quite like this one; similar enough that there must have been access to a copy of this rare text, or that its contents must have been otherwise transmitted to these practitioners. For certainly in this case at least, we cannot speak of coincidence. The first “phase” of ritual in question, as practiced in the present day, is one of calling, and is its language recalls the Heian-period waka that first inaugurated the mystery of the three birds. One is to imagine oneself completely lost in the depths of the mountains, in an autumn twilight. One hears a high, lonely note from an unknown direction; one is called. In the second phase, also based on a single Kokinshū poem, and called a “winter” phase, one stands at one’s own gate (not lost, this time at home), listening for a sound or signal that comes from far away. The third phase – the precise details of which are closely guarded, for the time being, by those most closely involved – is called a phase of “multitude,” and is associated with the arrival of spring. 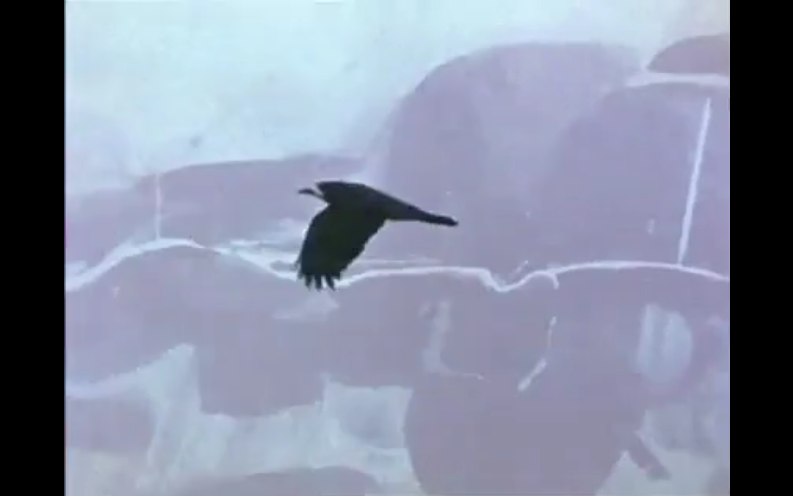 Returning readers of this blog will note that we have had previous dealings with the filmmaker Peter Greenaway, to wit, with his 1980 film The Falls (see the entry “The Gulls,” below). 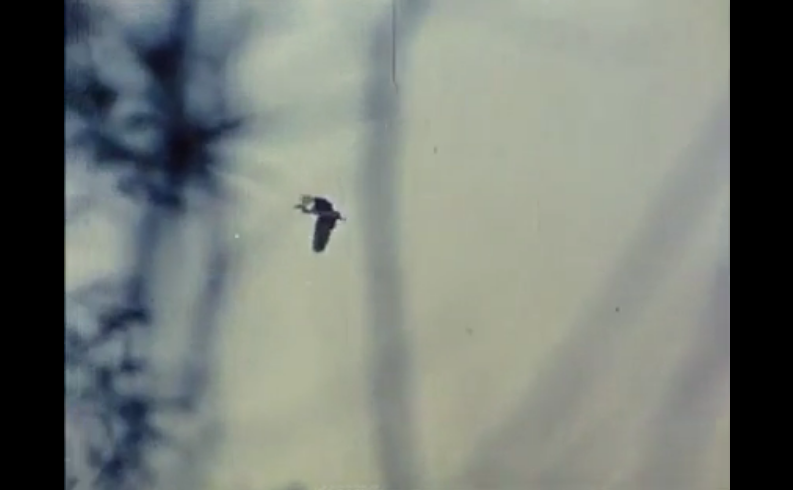 The numerous links between his source material for this documentary, his informants, and the Order of the Third Bird surprised none; but in their very profusion they obscured the equally fascinating case of Greenaway’s documentary film of two years prior, A Walk Through H: The Reincarnation of an Ornithologist. 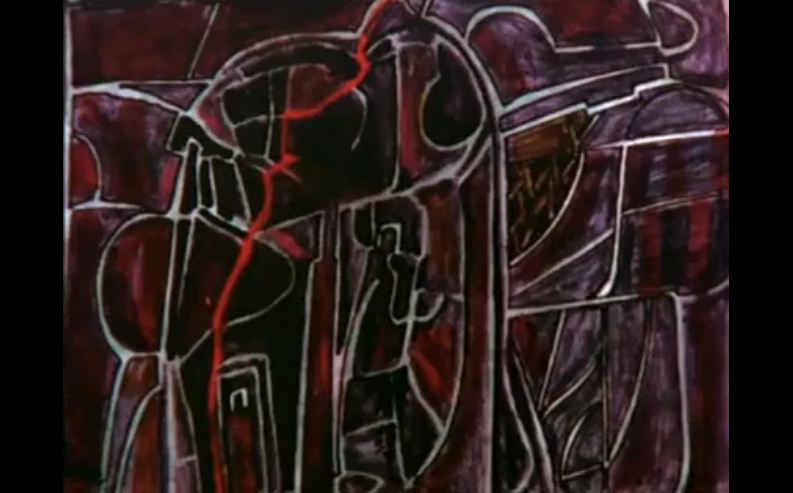 A Walk Through H is a film that concerns – a film, rather, that fixedly regards – “pictures.” Aside from the initial and closing scenes – where the camera tracks along a corridor toward or away from a room containing framed works – the film never lifts its head or its eyes from the images that so deeply and sinuously preoccupy it. The images themselves greatly vary. 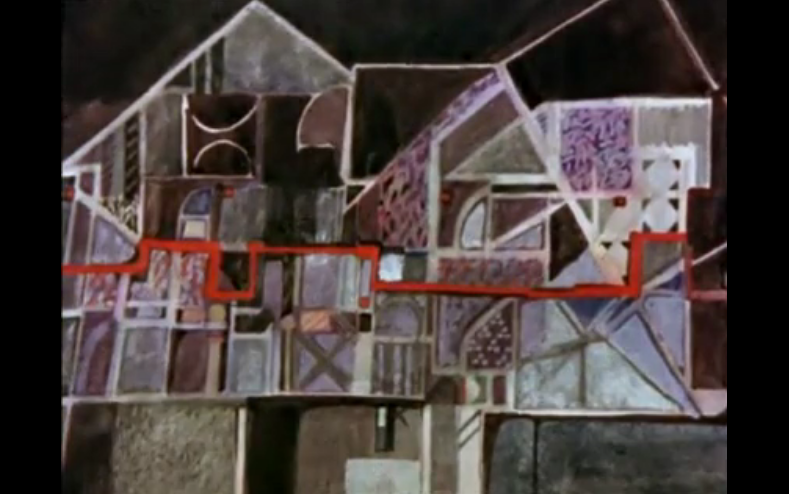 At the beginning of the film’s journey, for the most part, they purport to show cities, buildings, and rooms; a red thread traverses these spaces, representing a route to be taken through them, and transforming them into maps. Crucially, these are routes that have actually been taken through these spaces by the narrator of the film. 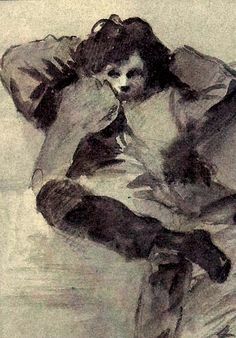 It is both unstated and beside the point whether he is, in effect, mentally tracing these routes while gazing at the images; whether he carries the pictures on his person and lets them alter his inner experience of a physical landscape he is crossing; or whether indeed he literally enters the pictures in question. It is well known that practitioners of the Order of the Third Bird can have difficulty making such fine distinctions. What makes this question somewhat more difficult is the fact that it is often the very act of traversing a space, whether in thought or deed, that makes it traversable – a principle that holds even as cities lose their names, rooms lose their walls, and even the yellow (or red) brick road loses its definition. 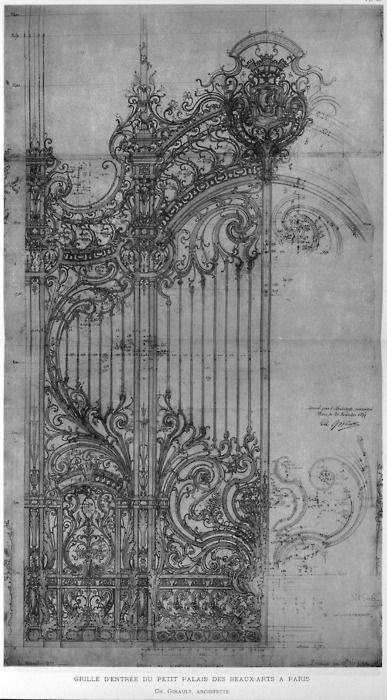 Treating works of art as maps – or simply as enterable things, like windows or doors, or plots of ground to be walked and explored, is not unheard of, particularly for the adepts of the Order. A large collection of documentation within the W-Cache, for example, has to do with musings on and results of such activity, the greatest portion of which is attributable to the secretive, fiercely insular volée of Birds located in the windswept old coastal town of Ipswich in northeastern Massachusetts in the mid-twentieth century. The collection mostly consists of original and reproduction images of houses with large numbers of windows, in a multitude of styles, and includes at least one of the framed works treated in A Journey Through H (see below), which the group conspired to obtain in the early 80s. The group is said to have specialized in a “protocol” of sustained attention inspired by mystical traditions dating ultimately to the first-century Talmudic academies of Asoristan (in Sasanian Mesopotamia), in which a house or palace with many rooms, wings, and floors is traversed in the mind. Works of art, of course, accommodate as many journeys as there are journeyers, even though details of these journeys often uncannily coincide. In fact, there exist theories that the work of art is a single, unchanging locus, but so richly endowed with potential configurations and trajectories of experience that it may as well be a different thing, in a different place, for every person who encounters it (this is not the same as saying that the work of art is redefined by every new encounter with it.) There are also theories, it must be mentioned, according to which all existing works of art are partial maps of the terrain of a single alternative universe, over the surface of which Birds endlessly travel, leaving their minute, whorled, flocking trails with every collective Action of sustained attention. 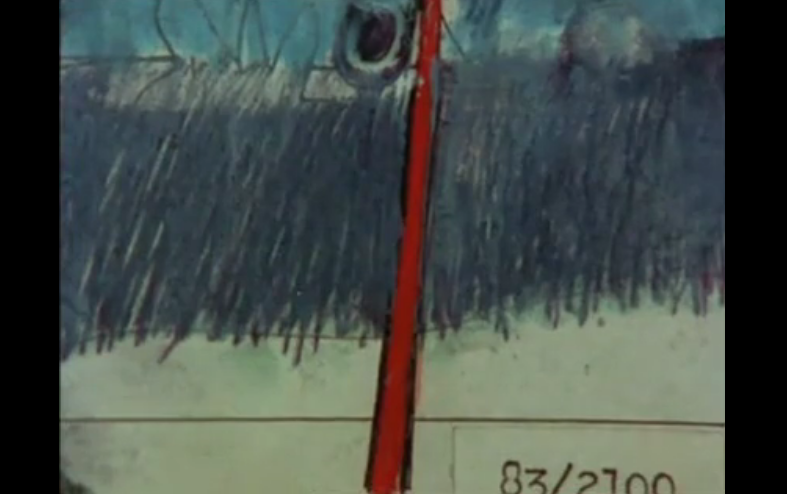 It takes very little to see that Greenaway’s film hints quite heavily in the direction of the Order. This raises a question, however – a question also raised by The Falls of 1980 – of what the great filmmaker stood to gain or to say from working the Order into this document of a singular journey. One clue lies in the fact that many of the purported “maps” for this journey are layered over or cut with images of birds in flight. In some of these images, birds fly against the background of the tangled branches of winter trees, which resemble the tangled paths of the maps; their winged bodies form abstract ciphers that often strikingly resemble the “windmills” mentioned above. 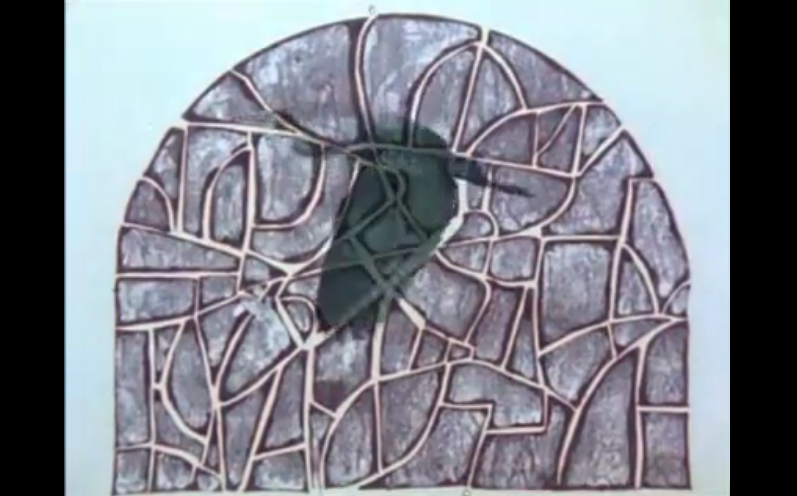 It must be stated that there are two kinds of “windmill” in A Walk Through H. There are, first of all, the windmills that replace the maps once they inevitably fade, after use (below, left); then there are the shapes that increasingly, troublingly proliferate upon the maps as the film progresses, functioning both as guides and as obstacles (below, left). Though Greenaway in no way directly indicates that the windmills are birds (indeed, the reader might object that windmills are often quite hazardous to birds), the insinuations in this direction are forcefully underlined toward the end of the film, where a book by the great traveler and ornithologist Tulse Luper, titled Birds of the Northern Hemisphere, makes its appearance. Here the comparison, as it were, flies in the face like birds flushed from the bush. If these windmills, of both kinds – implacable, silent, inscrutable – are indeed birds, a number of questions arise. 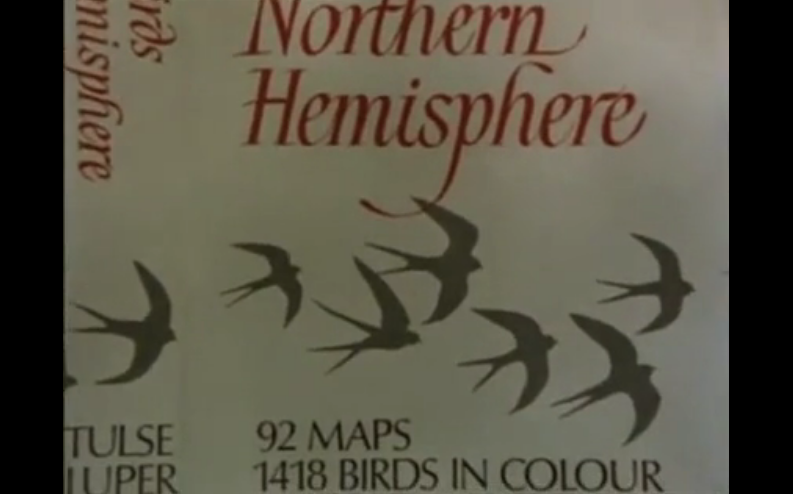 Why, really, do the maps, once used, fade to be replaced by birds? Does this represent an intervention in debates about the nature of attention, as suggested above, or some kind of comforting affirmation, or strict prohibition, or instead something more sinister? 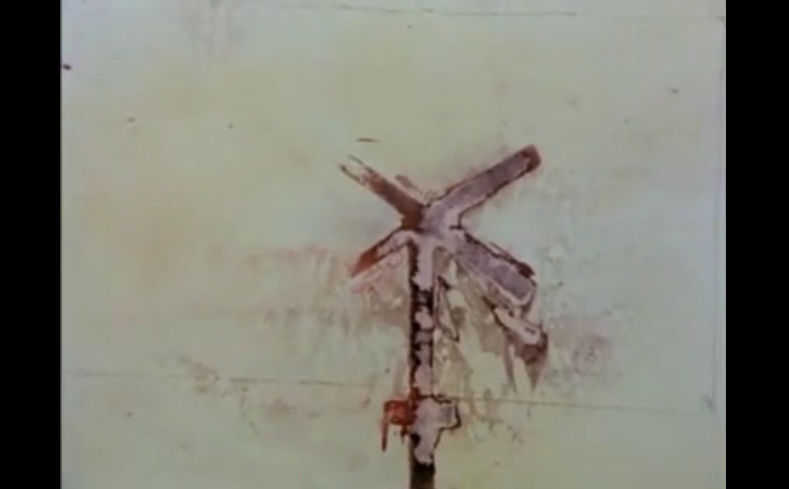 Why do these sigils so contagiously proliferate as the film nears its ambiguous denouement? Why would images of birds be so insistently used to counterpose freedom and unfreedom, passageways and barriers, the joy of flight and the despair of those lost in a maze? Greenaway’s troubled, ambivalent relationship with the Order, at the very least, is in full evidence here. Further mysteries linger. 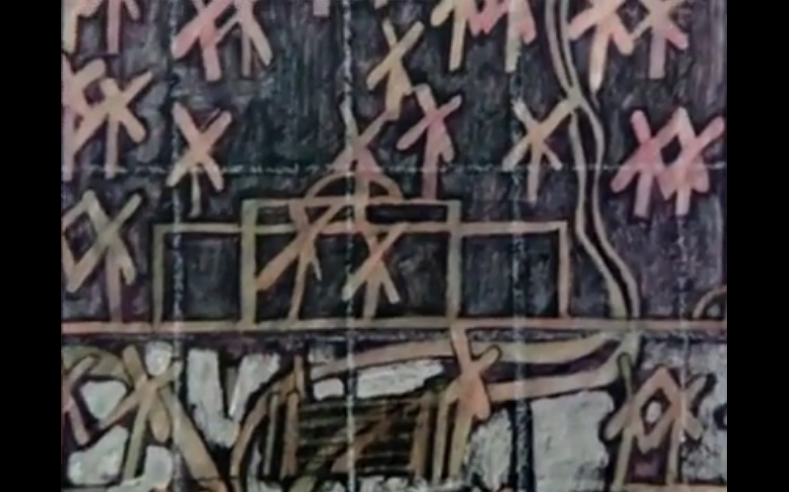 One of the images displayed in the film bears the figure “83/2100.” It just so happens that the W-Cache contains, in one of its ubiquitous file boxes – labeled “Telegnomy,” for reasons as yet unexamined by our researchers – a sequence of 2100 images, in varying sizes and media, bearing seemingly unrelated content. From this sequence, a single image is missing: number 83. The question of whether the formation of this W-Cache collection predates the filming of A Walk Through H would thus be of the greatest possible significance with regard both to Greenaway’s history with the Order and to the history of the Order itself. 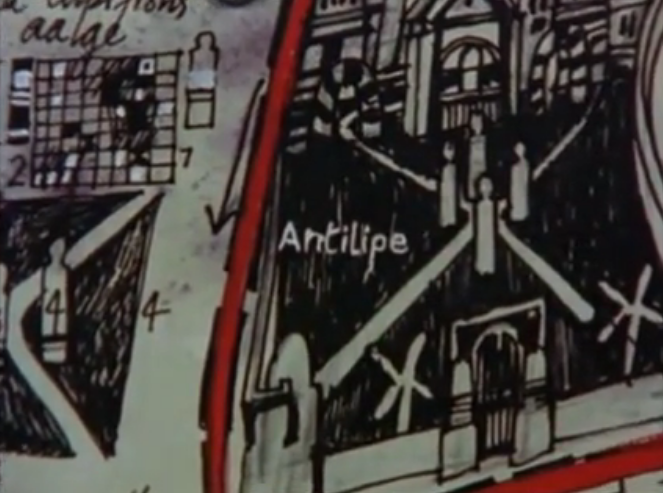 Though perhaps here we are making a mountain out of a mere numerical coincidence – a human error among the many to which we cannot be considered immune – it is certainly no coincidence that an image of one of the “cities” in the film, called Antilipe (supposedly located in Syria), quite clearly shows an Action of the Order taking place. 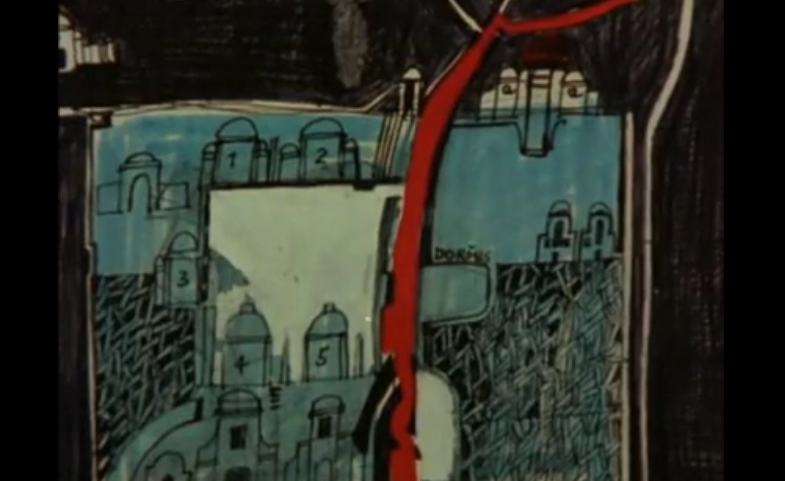 Still from film: an Action of the Order of the Third Bird taking place in the “city” of Antilipe (Syria). 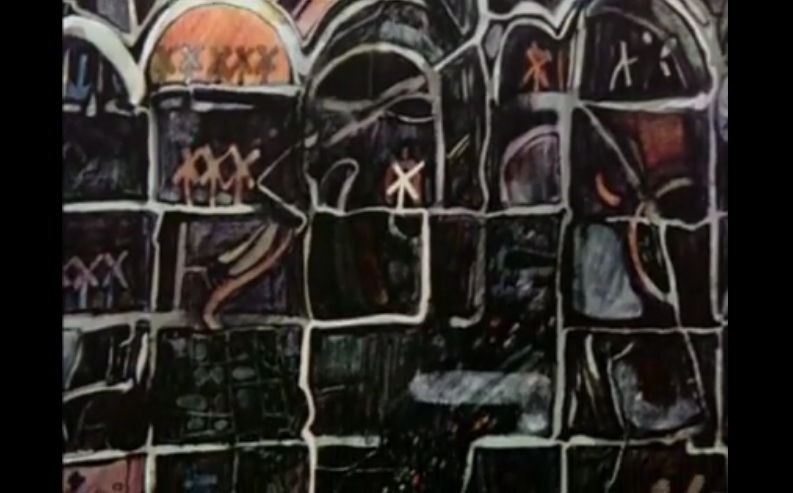 Note the four Birds at center and the two bird-sigils at bottom left and right. What manner of Protocol, what esoteric lineage of practice, might this strange image reveal? Did Peter Greenaway, at some point in his life, encounter the fabled Syrian Order of Birds (now familiar to our readers from a number of recent and groundbreaking ESTAR(SER) publications) – and find himself transformed by this encounter? 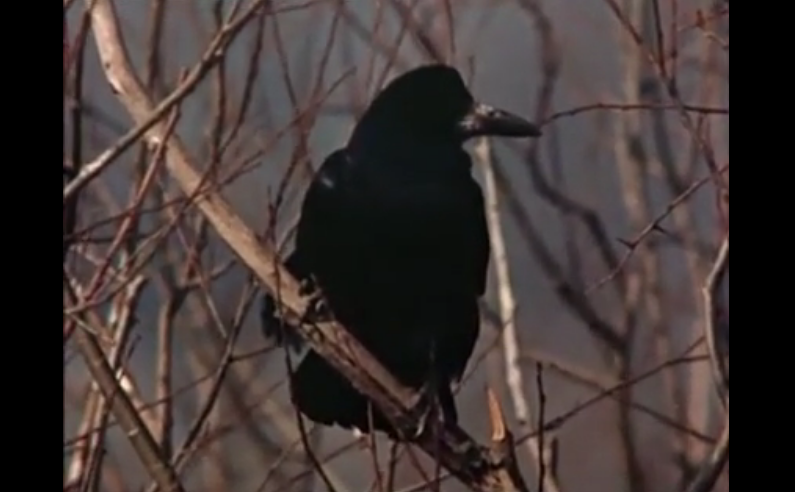 Was his life altered by an experience that was both as sharply defined and as nameless and fleeting as – to use the film’s words – “a path made across the grass by the shadow of flying birds”? We have recently received word that an associate of the Order of the Third Bird, known as Martin-Pêcheur or Kingfisher, has completed a journey along the medieval pilgrimage route known as the Camino de Santiago or the Route of Santiago de Compostela (or in French, Saint Jacques de Compostelle) – the route of the “field of stars.” What is most extraordinary is that on his way, he was able to find and join gatherings of other Birds, and participate in Actions of sustained attention to the precious objects and works scattered along the route as in a starry sky; and not only this, but was able to uncover the long-lost story of a goldsmith Bird, reaching out into the past, in an act of historian’s attention, to unify a scattering of facts into a new constellation. 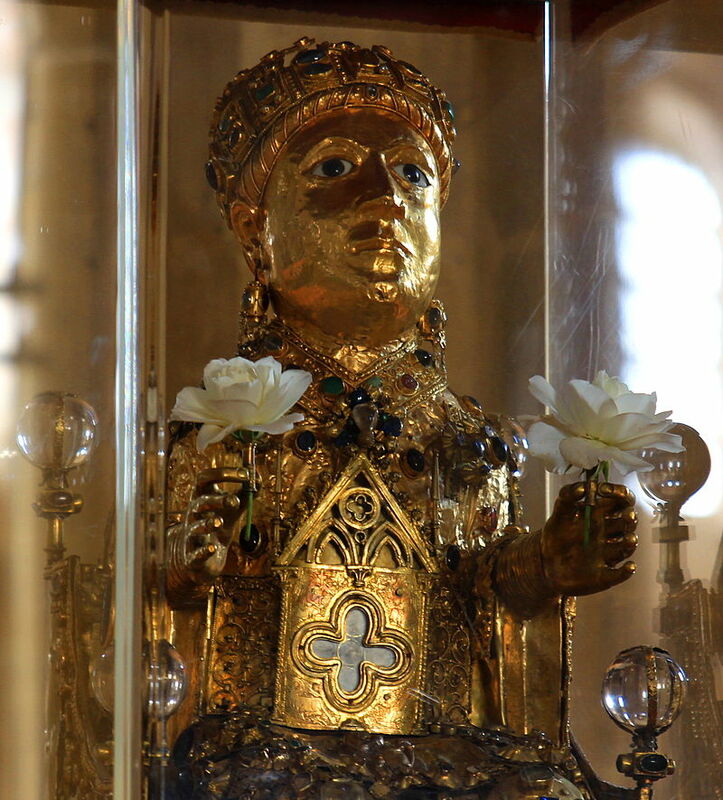 For some time the details of the creation of the goldsmithed reliquaries and treasures of Sainte Foy, in the village of Conques on the Compostela route, had been obscure – and as it so often happens, we can see that this story is caught up in the tangled history of the Order, whose traces our correspondent seeks. Here are his words, modestly translated by one of our editors. Birds of the Order know ways of making themselves receptive to legends that are told about others of their kind. Among the histories relayed by oral traditions, it often happens that the members of this very discreet Order bestow something of themselves to posterity through the play of symbols, and that their presence and their labors reach us, across time, to be grasped only by those who have ears to hear. Having on numerous occasions heard the joys of the pilgrimage road of Saint Jacques de Compostelle evoked, I could not help but recall certain of the little details that persisted across these testimonies. Until the last century, there rose in the middle of the bridge [at Le Puy-en-Velay] the statue of Notre Dame du Puy, standing witness to the links of the Compostelle pilgrimage to the great Marian sanctuary of Puy in Velay. Now, according to the legend, a little bird would fly up the river, wetting its wings in flight, in order to bathe the visage of the Virgin, and all living there saw in this a sign of abundance and prosperity. Alas! Victim of the indignities of the years, the statue, very damaged, was transported in 1846 to the San Pedro church, where it is known by the name of the Virgin of the “Chori” (bird) or “Txori” in Basque. But since that year, the little bird has never appeared again.” (Translated from Patrick Huchet and Yvon Boelle, Sur les Chemins de Compostelle, Editions Ouest France (2014)). It did not take much more than that for me to undertake to prepare for a Compostelle pilgrimage, for it did not appear to me impossible that the Birds, from near or far, had traveled these routes and Practiced on the way. Although from the beginning I encountered signs of the possible presence of Birds – numerous sculptures representing birds, and this from the moment of departing Puy en Velay – I will not tell the story, however agreeable it might be, of my first ten days of walking those fields and forests whose beauty little by little soothes those who tread and traverse them. I will begin, rather, with the story of my arrival in the celebrated town of Conques, an important stopping place for the pilgrims of yesterday and of today. who filled the valley with their melodious songs. Translated by Hannah Green in Little Saint (Modern Library, 2001). 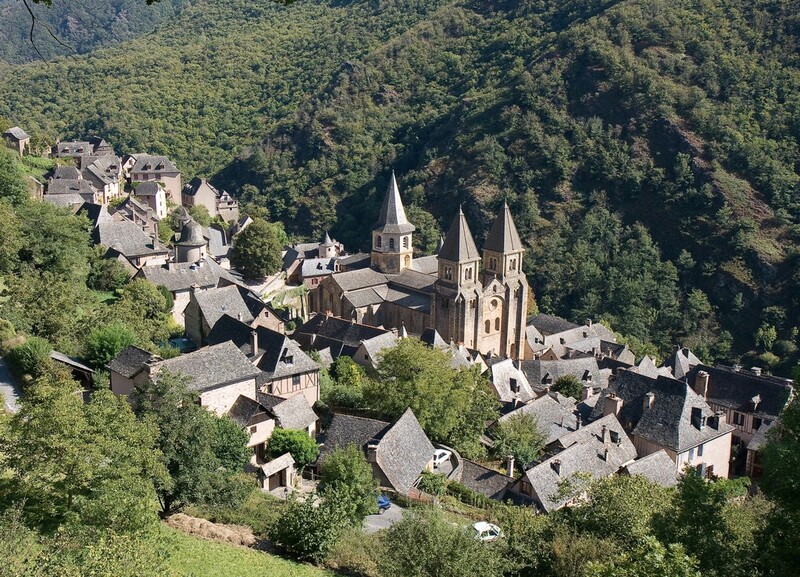 One arrives at Conques as if falling upon a nest, and especially for those on foot, the town only begins to appear as one descends into the hollow of the valley between two abrupt slopes. 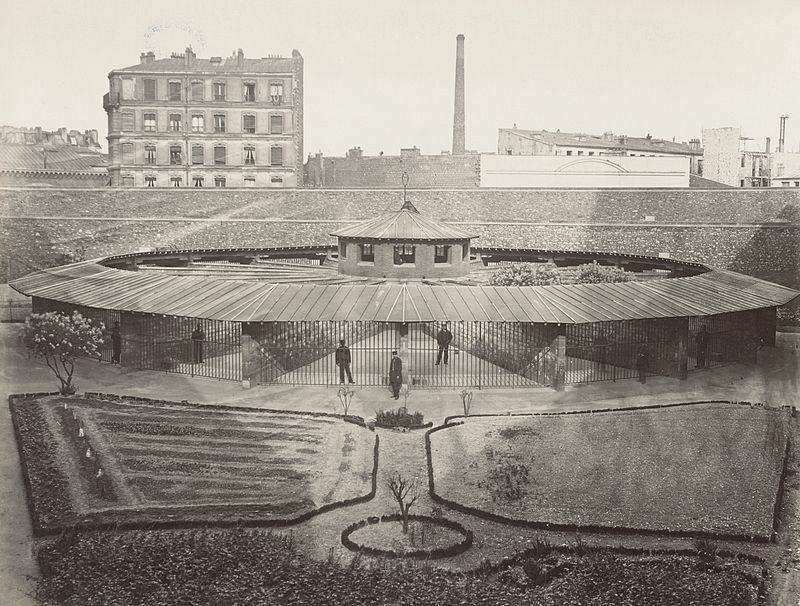 The hidden village takes its name from the shape of this hollow in which it was built,resembling a Saint-Jacques shell (or king scallop), which always reminds me of spread plumage, its feathers composing a gracious fan. 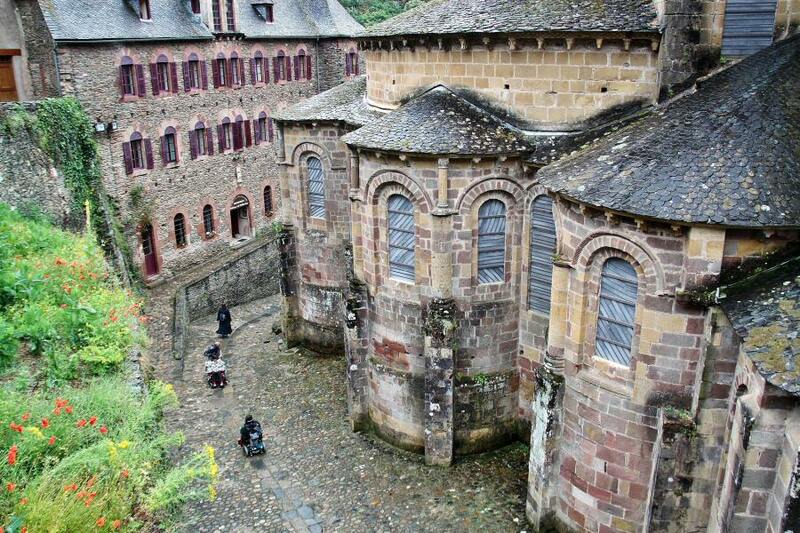 The grand abbatial church of Conques carries itself like a treasure in a jewelcase, and one can walk all around it upon the village’s various elevations, while remaining very close to it. In this way one has the impression of flying freely around its imposing architecture. The place is ideal for states of contemplation, and seeing it I better understood – and later, better still – the painter Pierre Soulages who created the stained glass windows of the abbatial church and who writes: “Conques is where I experienced my first artistic emotions.” After wandering the village in search of signs and evidence, and interrogating several of the monks who welcomed me to the Abbey, I was advised in mysterious tones to cast my eyes upon the treasure in the abbatial church, which I did. “Rare and remarkable,” “splendid and marvelous,” “astonishing, fascinating, mysterious, even enigmatic,” not to mention “unique.” Over time, descriptions of this treasure have become an admiring litany. 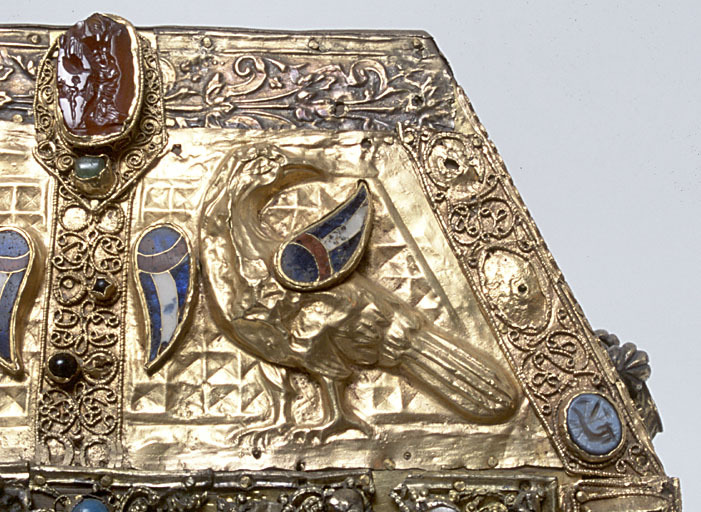 The relics of Sainte Foy are contained in goldsmithed pieces of a rare finesse, and upon which one beholds, in their enchanting beauty — birds. After some drawn-out moments of observation, I asked the guide if the artisan of such beautiful pieces was known. He responded then that the donor of the relics was known, and their sponsor, but not the one who had forged them such beautiful enclosures. The Book of Sainte Foy itself has had several of its pages torn out, those concerning the realization of the works conserved at Conques. The only mention of the artisan is found in another chapter of the work and must have been forgotten by those who wanted to rub out its traces: the name of “Noddy, the blacksmith of the field of stars,” concealed among its lines. I could not but be arrested by the name of this mysterious blacksmith, since he bore the name of a bird. Convinced that this was here proof sufficiently solid to carry my researches further, I contacted a Bird of the Order for assistance in exploring to this purpose the documents contained in the prolific W-Cache, well known to students of the Order. While I was waiting for the results of inquiries, my travels continued. But it only took a few days – during which I came upon no more signs, but began to understand the bewitching perfection the art of this blacksmith had attained – for someone to contact me. Some pages of a manuscript strongly resembling the manuscripts I had consulted at Conques were, in sooth, found in the W-Cache. Unfortunately, they were almost illegible – although below is a reproduction of the parts of the text we were able to read at the cost of a long labor of decipherment of Latin graphs and medieval abbreviations. After several months of research, a true encounter became possible with the mysterious blacksmith of the field of stars whose discretion when it comes to the things of this world is equal to the excellence of his artisanship. Master Noddi was not only one of the greatest artists of our time, but his heart had been refined in the fires of long years walking the paths toward the holy city of Santiago de Compostela. This artisan accepted – though not without hesitation, given his habitual humility – to realize the pieces asked of him. In exchange he made several astonishing requests, which nonetheless were not of the sort to trouble the unfolding of his work; they were granted him. The first piece is finished. The Sainte Foy in Majesty is a marvel of goldsmithing. The statuette measures 85 centimeters in height. It is made of yew wood covered with gold, gilded silver, and enamel, and set with gems that enchase the skull of this Carolingian majesté. I cannot find the words to describe the unbelievable beauty of this work. As previously agreed, a group of unknown men and women were seen to gather around the reliquary after its creation. Numerous guards were of course present to assure themselves of the intentions of these visitors, who remained a long while fixedly and silently observing the reliquary. I do not believe I recognized the prayers they enacted, but I do trust the artisan with regard to the significance of such a gathering. The group then left the grounds and drew away near a great oak tree which offered them shade during a conversation the context of which was never communicated to me. The collection is completed, with neither delay nor any disappointment as to the exceptional quality of its working. It is composed of a hexagonal reliquary; a pentagonal reliquary; the famous “A of Charlemagne”; a chasse, a Crucifixion plaque, a lantern in the form of an antique tomb, an enthroned Madonna and Child, a Pope Paschal reliquary, a reliquary tryptich and a reliquary arm of Saint Georges. Before Noddi once again took up his journey and his guests dispersed, I was invited to strange ceremony which, I imagine, is a rite transmitted from artisan to artisan. Since our man has mastered his art to perfection, I decided to pay my respects at this occasion which could not, I believe, do any harm to the diligent conservation of the Holy Relics. We observed four silent phases of which I cannot be sure of the length, and which I describe below. The first phase consisted of considering, before all, the space that welcomed to the receptacles created for the different relics, and illuminating in one’s thought the fires of the forge, preparing to submit to it all their materials. The second phases required an attentive observation of the work, a total and unconditional acceptance of it. A third phase was consecrated to a kind of decomposition of the work, into the various forms of matter that composed it, rendering to nature, which had produced them, the minerals and precious stones used for its creation. Finally, the fourth phase demanded a consideration of the work as if each of its forms, its colors and its materials possessed the force and beauty of a celestial work, and thus to cultivate in oneself the greatest astonishment and the grandest admiration for it. I must say that despite my initial reticence, the experience was of great interest, even if I do not believe I have gauged its fullest amplitude, lost as I was amid my thoughts, which assailed me without cease while the other participants seemed so profoundly absorbed in the activity of contemplation. However I sensed being born in me a curious relationship, dense and vibrant, with this piece of goldsmithwork. Several times I thought I saw the door come half ajar which might lead to a full understanding of these objects, as if I were about to enter for the first time into the heart of things. But these fugitive sentiments were extinguished as quickly as they appeared. It is not impossible that it was the witness of this Practice himself who sought to withdraw these passages from the final manuscript of the Book of Sainte Foy, so as not to risk being accused of paganism. It might also easily be that a migratory Bird deliberately safeguarded, in this way, the discretion of the Order. In this way it is now added to the practices and protocols now conserved in the archives and will, I hope, utilized by its contemporary inheritors. In the meantime, research on the goldsmith of the field of stars can only continue and be documented by other students (or members) of the Order who undertake this pilgrimage and who find on their route other signs and wonders leading to a better understanding of this remote forebear of the Order. Sense the elements and the materials around and in the work and envisage their response to the fire of the forge. Observe the spark of life that the work has been given, its open presence to the world, its existence, its breath. Decompose the object into its different constituents and imagine that each returns, in its original form, into the mines, the rivers, the forests or the quarries from which it came. Imagine that the work is made of a precious metal, a fragment of a meteorite or of a star with extraordinary properties; embrace its strange, alien, and magnetic power.